Successful girls night out parties depend upon having a great set of girl friends invited, an exciting plan of action and attention to details. 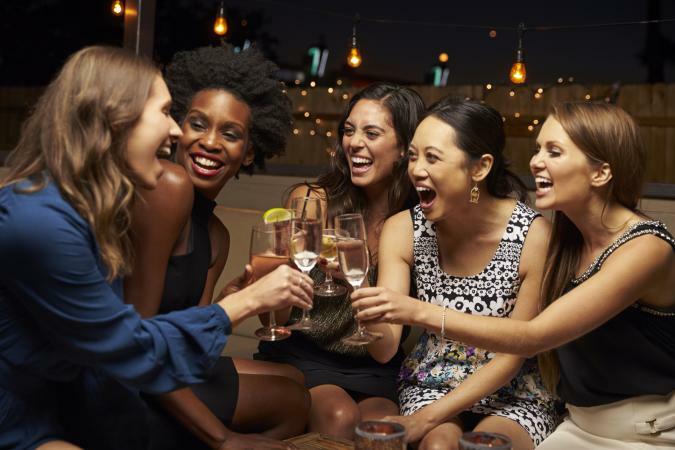 Though many girls night out events are hosted because of another celebration, like bachelorette parties, girls-only adult birthday parties or divorce parties, they are a fun way to get together with close friends any time. Planning a girls night out involves not only coming up with a fun activity for everyone, but tailoring the guest list to the event. After all, not every grandmother will want to attend an "intimates" sales party, nor will every party-hopping 21-year-old want to attend a cooking class. Yet friends and family can be interested in trying something "outside the box" of their normal activities. Invitation wording is important so that everyone understands exactly what is planned for the girls night out. Mail the invitations several weeks in advance, so babysitters can be booked and other plans rescheduled. Online invitations are a great way to contact busy women who are tech-savvy. As long as the activities are legal, just about anything goes at a girls night out party. The party theme can be all about pampering or getting one's groove on. Reconnecting with friends and family is the main point of getting together. Classes and workshops often cost money, so to make it more affordable for everyone, consider hosting a girls night out party once a month. Each month, someone in the group takes the stage as the "expert" and teaches everyone else a new skill that only she knows. Rotate homes and "kick out" the men before getting together. Serve appetizers, mini-desserts and drinks to everyone who attends. Transportation: Compare the cost effectiveness of carpooling with parking fees and gas to taking taxicabs or renting a limousine for the evening. Factor in whether or not guests will be drinking and how much money is in the party budget. Schedule: Have a tentative timeline for the evening. While it does not have to be followed perfectly, it helps to have an idea of a dinner and departure time. Childcare: When a large majority of guests have kids, it can be hard to secure childcare without paying a lot of money to a babysitter. Consider paying several responsible teenagers or young adults to watch everyone's children at the local playground or indoor kids' recreation center. Back-Up Plan: Even with a detailed checklist and timeline, things may go wrong. It helps to have a back-up plan in case things go awry at the party. Save a few cab numbers in the cell phone and know the nearest emergency room. Give everyone a meeting place and time if they are separated from the group. The most important detail to remember is that girls night out parties do not have to be perfect-they only have to be fun. Enjoy an evening out of the house while bonding with female friends and family.